Prolific horror novelist Graham Masterton veers away from his usual style of graphic, stomach-wrenching terror with Ghost Music , presenting readers with a haunting, yet faintly charming ghost story. Jingle-writer Gideon Lake experiences love at first sight when he sees Kate Solway gazing at him through the window. Despite the fact that Kate lives in the apartment downstairs with her husband Victor, Gideon can't help but embark on a passionate affair with the gray-eyed beauty. When Kate begins taking Gideon on a series of romantic vacations in Europe, he begins to witness strange, spooky behavior from her friends -- and from Kate herself. Phantom images, violent nightmares, and ghostly apparitions follow Gideon wherever he goes and Gideon is forced to question his relationship with Kate. Taking the advice from his upstairs neighbor Pearl -- an eccentric old woman who forever waits for her true love to come back after a years-long absence -- Gideon must tread carefully before he becomes a ghost himself. Ghost Music is very unique from the rest of Graham Masterton 's work in terms of tone, style, and theme. Whereas Masterton will usually initially catch you off-guard with a violent bang to set the tone, the style of Ghost Music is very lyrical and romantic, though slow to pull readers in. Readers who pick up Ghost Music will need to be extremely patient, as the novel is oftentimes monotonous and we've figured out what's going on way sooner than Gideon does. The novel carries an air of mystery; after all, we've figured out why Gideon is the only person who can see all the ghosts, but the real question is, what do all the ghosts have in common and how will the novel climax? The horror element is very much in full effect after the first half of Ghost Music -- but it's not the nauseating blood and guts Masterton usually presents to us. However, the terror that is ultimately projected is well worth the wait. 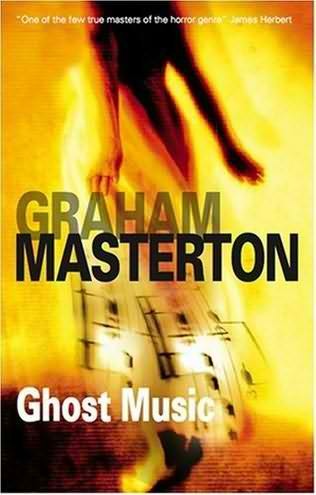 Devoted fans of Graham Masterton may struggle with Ghost Music and I would say the odds of readers enjoying the book is 50/50. I believe the novel just further stresses Masterton's versatility as far as his talent his concerned, and of course I'll always remain a loyal fan. The next novel we'll be seeking by Masterton is Descendant , which involves vampires, Nazis, and the Cold War. Fun!